A long time ago SolarNode development switched from a traditional style Java application to a modular OSGi based one. One of the reasons for the switch was the premise of allowing users to easily download and use SolarNode modules without having to restart the SolarNode application. In OSGi installing, starting, stopping, and uninstalling modules (called bundles in OSGi) is fairly trivial. What SolarNode has lacked, however, was any friendly UI to allow users to browse the available modules and install the ones they want. Finally that is about to change. The first step to enabling this feature was the deployment of a SolarNetwork-hosted software repository. There are a few open source packages out there, I ended up using Apache Archiva. 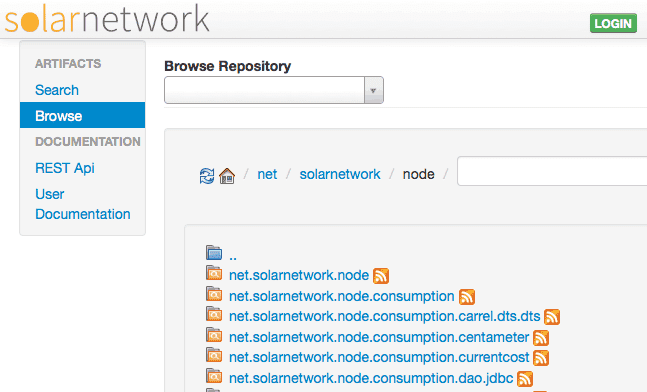 Now SolarNetwork has a Maven-compatible online software repository to host its own modules, and the build infrastructure has been updated to easily publish modules as they are developed. The next step was to make use of the OSGi Bundle Repository (OBR) developed as part of Apache Felix. OBR provides a way to resolve OSGi bundles along with their dependencies. Unfortunately, Archiva does not publish OBR metadata so I turned to another Apache project, Karaf Cave. Cave can act as a OBR proxy to a Maven repository, in which case it scans the Maven repository and generates OBR metadata files from which the OBR resource URLs point back to the artifacts in the Maven repository. This is a big step forward both in terms of ease of use for users and the SolarNode software development process!